During my readings I came across two very different quotas about the problem with strategy and boxes or categories. 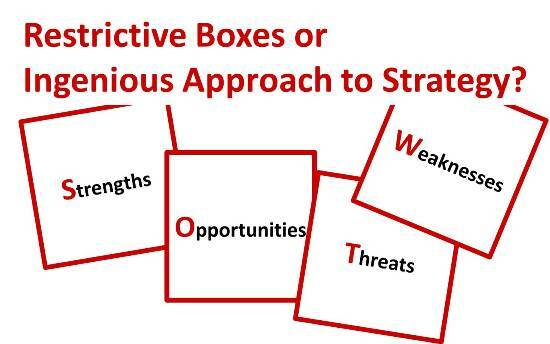 Strategic thinking and mental boxes are two things that don’t fit together very well. There is the problem that we are all too easily inclined to refer back to past experiences when we face complex problems. I have already stated that experience is a great thing. It prevents you from making the same mistake twice. They improve our efficiency. If you found out what works once, you can apply this solution again and again. No need to reinvent the wheel. Unfortunately, this efficient way of doing things comes with a drawback: If our ancestors had always relied on their experience, we would still pull the dead prey along the ground to our caves. No need to put it on a shelf and mount wheels on it. Strategic thinking – as well as creativity – has to take place outside well-known mental boxes. This is the only way to come up with new ideas. It is hard to think outside the own mental box. Sometimes it is easier to just improve the box. I think this is a very important point. One reason why so many people have problems to develop really good strategies or strategic ideas is that it is so difficult to think outside our own mental boxes and categories. In view of a complex and unstructured problem – such as strategic planning – our mind naturally tries to refer back to some known categories, just to find a way to tackle the problem. Our brain is programmed to minimize energy usage. Hence, it prefers to refer back to known structures and solutions. This is the best approach if you are just attacked by a sabre-toothed tiger. In this situation you instinctively do what has worked before: you run away. You wouldn’t try to invent the gun. This genetic programming is probably one reason why all those management models and tools are so popular. They help us to structure, process and consolidate the vast amount of information and the fuzzy, complex situation. The point is, however, as long as we stick to these known categories, we are rather unlikely to come up with really new insights and ideas. I guess most of us are simply not trained to think beyond our familiar mental boxes and categories. To my experience, one approach for solving this dilemma is to infuse some out of the box thinking by bringing in people from outside our boxes. This might be an industry outsider or just somebody from another department. Such outside team members can be extremely enriching. Even if they bring along their own boxes – these are other boxes and by applying them to our problem we from the inside may start to see things from a new perspective. Successful businesses do that by deliberately hiring people with very different and even unusual hobbies and CVs. Thus they ensure a constant inflow of new ideas, new ways of seeing, understanding and handling things. I assume this large array of very different boxes helps all of them to think a bit more outside their corporate boxes. A very good article, something to think about and also implement.